This is a phrase I hear quite often from folks who know this beautiful little town, but don’t live here …. yet! The town has charm and grace, the community is hospitable and friendly, and the landscape is … well … spectacular! Bishop and surrounds have incredible natural beauty, a wonderful climate, and a multitude of outdoor activities in settings that are considered world-class. It’s close to two of the country’s most impressive National Parks, Death Valley to the southeast and Yosemite to the northwest. From here there are places to go and things to do year round that can keep explorers busy and families active on any given day. There are adventures to be had, sights to see, discoveries to be made, challenges to be accomplished, achievements to be reached, and there’s solitude to be found. Yes, I am lucky to live here, but it’s more than just plain luck. It’s about determination. It’s about a decision to live a life filled with wonder and adventure. Now you may not live in Bishop, but that doesn’t mean you can’t take a leaf out the locals’ book and live your best life by visiting often and living it up … up here! Here’s how some of the notable locals live in Bishop. Fendon’s Furniture, Mattress & Reupholstery Co. is a Bishop institution. Randy’s dad, Jerry, began the business in 1949 and Randy now continues the tradition of quality service and products that has made Fendon’s into the largest furniture and mattress showroom in the Eastern Sierra. Randy says he spent a lot of time outdoors growing up in Bishop, but not doing the usual hiking, backpacking or skiing activities that most folks associate with the outdoors here. 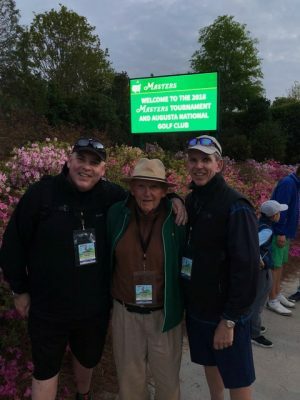 His dad introduced him to golf at an early age and many hours were spent on the golf course. Growing up in Bishop in those days was also meant playing rough and tumble street sports with his neighborhood friends. Bishop was that kind of small, safe town where kids could stay out until dark. “We had the run of the neighborhood,” he says. At about 18 years of age Randy acquired a 1970 Pontiac GTO muscle car, which he built into what he describes as “one of the faster cars in Bishop at that time.” Bishop was a typical rural western town in the late 1970s and the street cruising scene on Friday and Saturday nights was big and very cool, according to Randy. By the time he acquired the car he needed to work to support his hot rod habit and spent most of his free time after school working for his parents at Fendon’s. Once he graduated from high school, Randy spent 6 years working full time with his parents at Fendon’s. Like so many Bishop born locals he felt he wanted a change and some new experiences. He spent the next 20 years away from Bishop, beginning with attending college and earning a bachelor’s degree. In 2003 he returned to Bishop with his wife, Cheri, who was raised in a large and close-knit family in Orange County. When he and Cheri decided they wanted a more balanced life and not make everything about “climbing the ladder, working crazy hours and making lots of money,” Bishop was the obvious choice. It was home. “Growing up in bishop was wonderful. Leaving for a long time was good for me. Being back now is perfect!” says Randy. 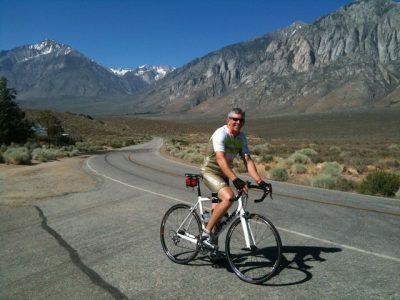 Aside from working in his garage or yard, Randy has developed a passion for road cycling. He joined the local cycling club, Eastside Velo, about eight years ago and now most of his and Cheri’s closest friends are from this association. The club has a broad member base covering both Mammoth, Bishop, and surrounds and organizes road rides and races year-round in the region. It has grown from a core group of 20 riders in 2001 at its inception to over 200 riders, with a good balance of women and men. Among the many supported and unsupported events hosted by club and its members the Mammoth Gran Fondo is the biggest and longest ride on the calendar. Held every year in September this event draws over 1,500 riders to the Eastern High Sierra for a 102 mile ride – that has only one stop sign! The roads around Bishop are just perfect for cycling. Traffic is light and there are numerous options for long or short, steep or flat, and all are indescribably beautiful. He was reminded of a conversation he had with his friend, Galen Rowell when they were at visiting at Whiskey Creek one night. Galen was an internationally acclaimed wilderness photographer, adventure photojournalist and climber who was introduced to wilderness before he could walk. He and his wife Barbara were both tragically killed after returning from a trip to the Bering Straight on their final approach into Bishop, in 2002. He recalls asking Galen, that of all the places on the planet he had seen and been to, why had they decided to move to Bishop? Kari Castle is a multiple World Champion & National Champion hang gliding and paragliding pilot who holds numerous free flying world, national and state records – some of them set right here in the Owens Valley. She began hang gliding in 1981 and soon her desire to pursue her “flying addiction” full time brought her to Bishop in 1988 where she has lived ever since. Kari spends some of her year traveling as an official for competitions and as a coach and guide to the sky. Kari loves chasing her many other athletic endeavors as well. She is also an accomplished rock climber, cyclist, skier, kite-surfer, and wave-surfer, which means getting to an ocean occasionally is necessary to pursue the latter two. But Bishop is home and it is here in our big backyard that she can play and workout and share her passion for the outdoors with others. 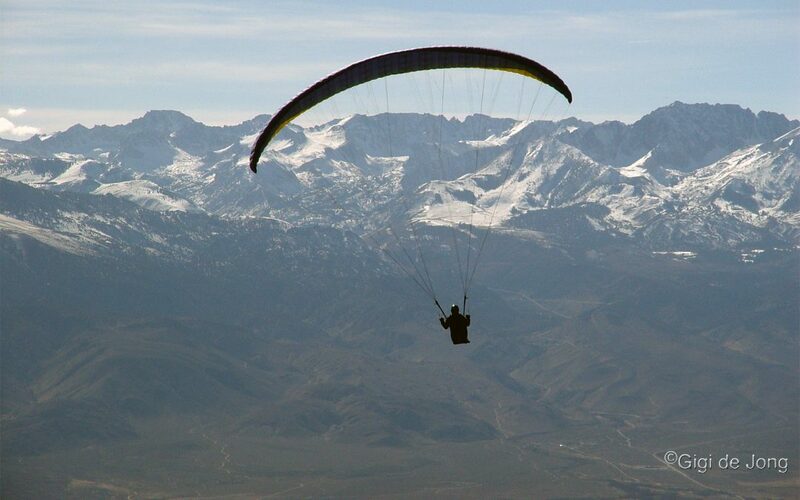 In the 1970s the Owens Valley became the Mecca for the growing sport of hang gliding. Pilots came in search of longer flight times and greater distances and numerous cross-country and world records were set here – many by Kari. Now with the advent of flatland flying due to innovations in towing pilots into the air, the Owens Valley is the place where pilots convene to experience the thrill of big mountain foot launches and the ‘big air’ of this hot high desert valley. This sport is definitely not for the uninitiated or faint-of-heart. “Flying the Owens” requires training and experience. Kari shares her love of the Owens Valley and flying these skies with visitors who want to learn about the thrilling free flying experience. She can take you on a tandem instructional flight to soar high above the mountains and valley, or get you started on a training program so you can earn your own wings. Experienced pilots will also seek her out for her local knowledge and her wisdom. This is not just invaluable for first timers to the Eastern Sierra, but necessary for learning about the ‘big air’ of Bishop. His friends affectionately refer to SP Parker as “Bishop’s Local Legend” and, although he says he’d rather be infamous, he’s too much of a nice guy and conscientious of others and our environment to be anything less than positively legendary. In 2015 he was an instrumental voice in motivating for a statewide ban on the trapping of bobcat in California that was subsequently passed into law. 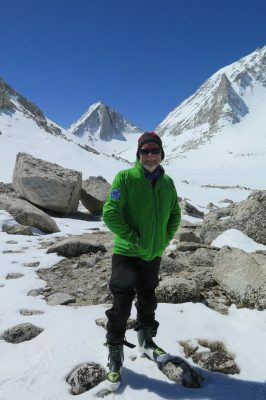 Originally from New Zealand, SP moved to Bishop in 1980 and has been running a highly successful outdoor guiding company, Sierra Mountain Center, since the early 1990s. He is an avid mountaineer and says that the combination of mountains and good weather was the motivation to move to Bishop. SP spends much of his time outdoors. Both his work and a desire to play in our big backyard takes him out there. “I get paid to be in the mountains – climbing, skiing and hiking,” he says happily. SP is an IFMGA (International Federation of Mountain Guide Associations) guide, which is the acknowledged credential for guides internationally. That means he is certified in rock, alpine and ski disciplines and, incidentally, was one of the early guides to obtain this qualification in the USA. He also developed the rock and alpine programs for the AMGA (American Mountain Guides Association) in the early 1990s. In fact, SP is a pretty quiet guy when he’s not pontificating about saving bobcat and such. So, if you want to get out into the wilderness for a little alone time, but need a guiding hand, SP will get you safely there and back while giving you the space to be alone with yourself and nature. Karen and Bruce met in the art department at UCLA. Both had been raised in the Los Angeles area and it was Karen who was first introduced to the Eastern Sierra during skiing vacations here with her family as a youngster. 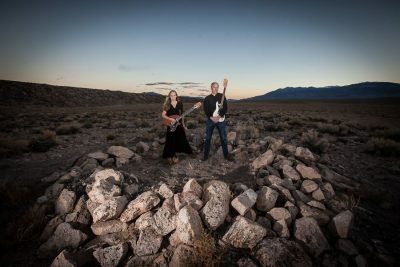 It became a long-held dream of hers to live and paint in the Eastern Sierra, but before that was realized she and Bruce spent 17 years in Sedona, Arizona. This dynamic couple are both multi-talented artists and have found a way to successfully merge their numerous artistic skills. Bruce began a letterpress printing business, Independent Project Press, in 1982 and built upon his skill and experience as a musician to develop unique packaging for the music industry. He is credited with having started the trend in letterpress-printed CD and record packaging using industrial-style chipboard and was twice nominated for a Grammy Award for his album packaging. The letterpress business requires space for the use of large, old printing presses, nevertheless, Bruce says, “I can run this business from anywhere.” The majority of his work is shipped to clients around the world. Moving to Bishop was a leap of faith for Bruce, who had never visited the area. 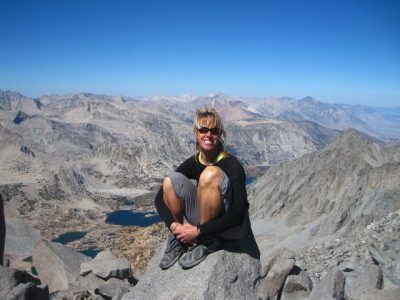 But Karen’s love for the Eastern Sierra was enough encouragement for him and the couple relocated to Bishop in 2009. Both agree that one of the best aspects of this town is the people. “We made more close friends here after just a few years than we did in the entire 17 years we lived in Sedona,” Bruce says. The Project Room, in downtown Bishop, as the business premises are known is a print shop and art gallery combined. The couple produces high quality letterpress products for local, national and international clients and printmaking classes are offered occasionally. The print shop and gallery space showcase Karen’s beautiful paintings as well as works from other local artists. 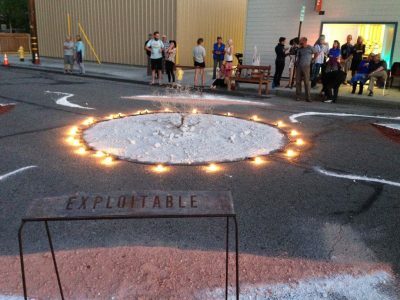 They have hosted wonderful street parties with musicians performing on a makeshift stage across the street and remarkable once-off installation art pieces created by Karen. There is a wonderful camaraderie among the local business owners here, especially those in the food and lodging services, entertainment, and art industries, which is backed up by a strong and active Chamber of Commerce. 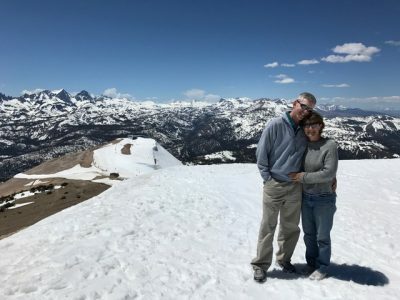 Although Karen and Bruce don’t participate as extensively in many of the outdoor activities as they believe others do, both draw their inspiration from the beauty of Bishop’s big backyard. “We are getting grounded,” says Bruce. In addition to her favorite Eastside activities, “hiking, hot tubs and painting outdoors,” Karen is also a practitioner and sought-after consultant in bio-resonant energy work and she encourages Bruce to join her in the practice of true grounding. “It’s literally standing on the earth barefoot each morning and soaking in a little healing morning sunshine,” says Bruce. 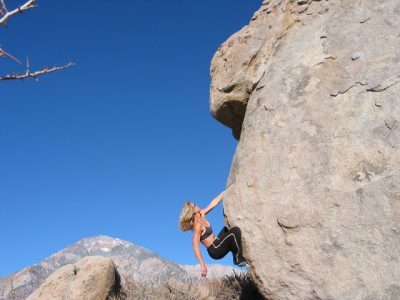 The desire to rock climb seems to be innate in most successful climbers. 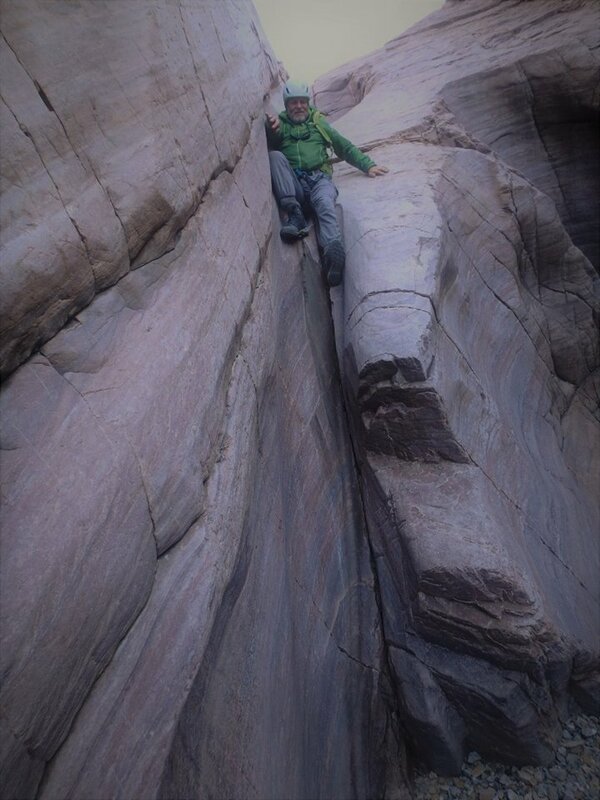 Katie’s story of ascendancy in the world of climbing clearly shows she has a natural talent and an inherent desire, but she wasn’t ‘born into the harness’ like so many kids of climbers. Katie was born and raised in Louisiana and only introduced to climbing at age 15. She was immediately hooked and knew she had to find her route to the top by going to where the big rocks are. In 2006 Katie arrived in Yosemite and it wasn’t long before her strength and passion paid dividends and she claimed numerous female first ascents in the Sierra Nevada. That brought the attention of sponsors and Katie now lives the life of a professional climber. Based out of Bishop, Katie keeps her mind, body and climbing skills sharp by bouldering in the nearby Buttermilk Country. Because these boulders are so easily accessible Katie is able to go out often for warm up circuits and work on a hard project (a declared route that a climber rehearses to achieve without falling or resting on gear.) She hones her skills on the many rocks and routes that our big backyard has to offer. “Just going out to the boulders with friends and family is pretty awesome!” says Katie. When she’s not traveling the world to climb, Katie is a climbing guide with Sierra Mountain Guides. She also serves as the Chief Operating Officer of Sacred Rok, a non-profit that works to introduce youth, especially at-risk youths, to nature. Visit Bishop. Love Bishop. Live Bishop. If you’ve never visited Bishop, or if it’s only a brief stopping point on your journey north or south along Highway 395, or even if you’re a frequent visitor, I encourage you to stop in at the Bishop Visitor Center at 690 N. Main Street. It is also home to the Bishop Chamber of Commerce. Take some time chat with the superb folks who staff these offices. Find out what it’s like to live, work and play here.